As much fun as the beach can be, it can also be a dangerous place if a few precautions aren’t taken. Powerful currents, beating sun rays, and biting sea creatures are just some of the dangers that can all make a relaxed day take a turn for the worse. Luckily, there steps to take to stay safe from all these things. These easy-to-follow beach safety tips will protect you and your family while you enjoy the ocean. Swimming in the surf can be a blast, but it can turn dangerous quickly. Make sure you are a decent swimmer before getting in over your knees, and never swim alone. Keep an eye on the coast to ensure you don’t get pulled out further than intended. When on a floating raft, don't float out further than you can swim back. Even on a lifeguarded beach, it is a good idea to leave someone on shore to keep an eye on swimmers. Always put young swimmers in an approved life-vest. Rip currents, sometimes called undertows, are powerful underwater channels of water that are responsible for the majority of drowning deaths. They are hard to spot from land, but are usually more powerful where the surf is strong. The safest course of action with rip currents is to avoid strong surfs, and to only swim at beaches where qualified lifeguards are present. 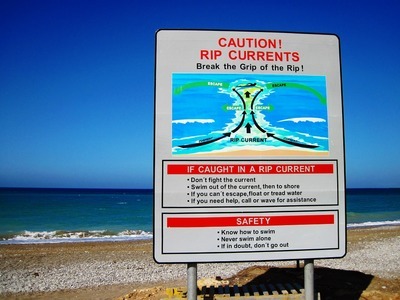 If you do happen to get caught in a rip-current, don’t fight it. Swim to the side until you no longer feel pulled by the water. One of the biggest dangers at the beach is not in the water, it’s actually the sun. 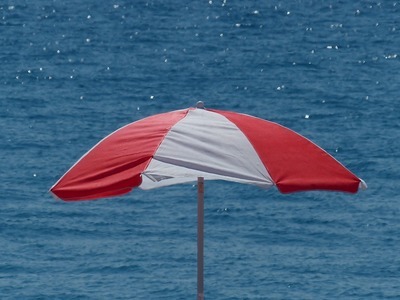 So many great beach vacations have been ruined by a nasty red sunburn. Not only is it painful, but sunburn at any age greatly increases the chance of developing skin cancer. Make sure to slather on a high SPF sunscreen before heading out into the sun, and reapply after a few hours or after a dip in the water. It’s also a good idea to wear wide-brimmed hats, sunglasses, and to take breaks from the sun under an umbrella or other shade. Many scary sea creatures seem to lurk in the depths of the ocean. Every summer, there are reports of horrific shark attacks. Luckily, shark attacks are actually incredibly rare. Follow beach guidelines, and don’t swim at dusk, and the chance of encountering a shark are miniscule. The sting of a jellyfish is a far more common and an unpleasant encounter, as are sea lice bites. Sea lice are actually the microscopic larvae of jellyfish. They have the same stinging cells capabilities as their full-grown counterparts. Sea lice bites are the result of the larvae coming in contact with skin, causing itching and a bumpy rash. To avoid stings, remove your swimsuit and shower immediately after swimming, and wash bathing suits in hot water before re-wearing. 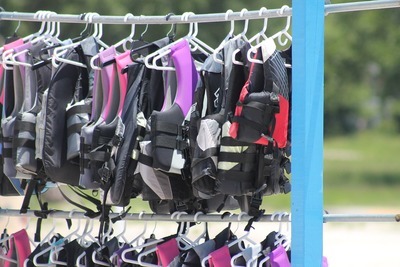 Special lotions are also available to provide a protective layer against sea lice bites. Despite some daunting dangers, there is no reason not to enjoy a day by the ocean with family and friends. Just a few simple precautions will ensure safety at the beach. Swim where there are lifeguards, be aware of rip currents, use lots of sunscreen, and watch out for stinging and biting ocean critters. Follow these tips for a safe and fun visit at the beach! How Well Do You Know Your Liquor Laws? What's the Average Cost of a Podiatrist Visit?